Ready to join us for an exciting Friday evening? Have you ever dreamed of wielding a light saber? Of dueling at dawn? Of rattling sabres aboard a pirate ship? Come to Cutting Edge Fencing for a taste of the Olympic sport of fencing and feel like you’re bringing movie fights to life! Once a month, Cutting Edge Fencing hosts a free class for anyone to come and try out the fantastic sport of Olympic-style Fencing. These are usually on the last Friday of the month, and are held from 7-8:30 PM. We’ll teach you the basic elements of fencing, show you how to move, and introduce you to the safety gear. Then you’ll get to hold a real fencing sabre and learn how to hit a target. And then… well, if you want to know exactly what comes next, come check out the class!!!! Wear sweatpants, a t-shirt, and lace-up athletic shoes. We provide all the fencing gear you’ll need. Bring a water bottle or sports drink as well. Check in on Yelp! at the club and get a free bottle of water from our fridge! We welcome everyone to participate: kids, adults, families, friends, everyone! Looking for the ultimate date night? This is it! Need an activity to get in shape? Fencing is for you! Please sign up below, email us at [email protected]…, or call us at (817) 428-5599. Space is limited to 20 participants. Ages 8 and up. We are a community of athletes, parents and coaches: centered on the whole athlete, focused on life-long personal development, striving for competitive success. 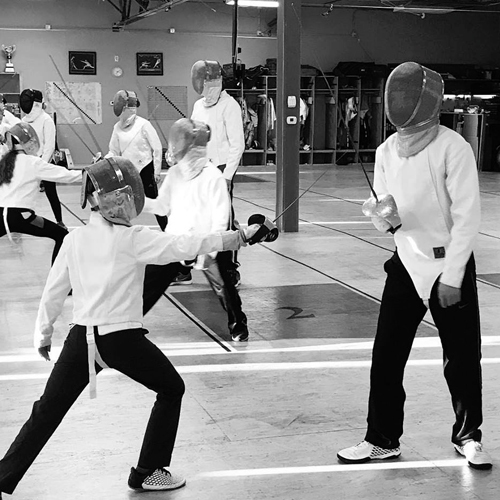 We serve the Tarrant County side of the DFW Metroplex: teaching the Olympic Sport of Sabre Fencing and competing at the Local, Regional, and National levels. We offer group classes, individual lessons and athletic training, as well as special events such as birthday parties, team building workshops, and fencing demos. Introductory Membership at Cutting Edge Fencing!